At USC Auxiliary Services, our mission is to create the best USC experience for our students, faculty, staff, visitors and community members, as we provide services across our six business units (Hospitality, Housing, Transportation, Bookstores, Radisson Hotel and the Los Angeles Memorial Coliseum). 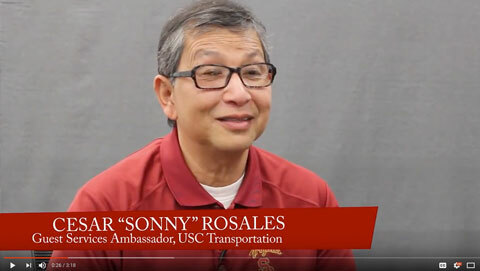 Auxiliary Services works diligently to welcome all visitors into the Trojan family and we are driven to succeed by our commitment to USC’s core values. Our team is comprised of some of the very best people in our industries, with diverse backgrounds and experiences, who come together to provide the best products and best service for all Trojans. Nicknamed The Greatest Stadium in the World, the Los Angeles Memorial Coliseum has hosted college football, professional football, two Olympics, a World Series game and numerous concerts since 1923. As the home for Trojan Football, the Coliseum has become a symbol for University excellence and spirit. USC has committed $270 million to Coliseum renovations to guarantee its continuing presence as a premiere stadium well into the future, serving all Angelenos and Trojans alike. We are seeking an Assistant Director of Coliseum Facility Operations to join our rapidly growing team. This position is responsible for projecting, planning and overseeing the environmental services, maintenance, energy management, sustainability, and environmental health and safety functions of the assigned facility, planning large-scale capital projects and budgeting, and collaborating with local governments to ensure project compliance, acceptance and coordination. The Assistant Director, Facility Operations assesses and organizes the organizational workload in a logical manner, manages special assignments and short-term projects, and maintains established systems and training programs. The position is also responsible for maintaining records and reports necessary to comply with all standards, regulations and codes. The Assistant Director, Facility Operations also manages an assigned staff as well as maintaining awareness and knowledge of legal, regulatory and technological changes that could affect operations. Project, plan, and oversee the environmental services, maintenance, energy management, sustainability, and environmental health and safety functions of the assigned facility to include plumbing, carpentry, welding, and other general maintenance. Ensure optimal integration, synergy, and cost efficiency in the development and implementation of operating plans, systems, and procedures. Strategically plan and project large-scale capital projects and related budgeting. Develop proposals for capital projects and facility improvements designed to utilize older facility inventory more efficiently and profitably. Assess and organize organizational workload in a logical manner to maximize efficiency and meet project deadlines. Plan or schedule staff accordingly, including arranging for temporary workers when necessary. Make any necessary adjustments to meet deadlines and commitments. Develop methods of communication with employees that focus on quantifying workloads and productivity. Collaborate with local city and county governments and municipalities on university planning and facility projects to ensure compliance, acceptance, and coordination. Recruit, screen, hire, train and directly supervise all assigned subordinate staff. Evaluate employee performance and provide guidance and feedback. Counsel, discipline, and/or terminate employees as required. Recommend departmental goals and objectives, including workforce planning and compensation recommendations. Reassess or redefine priorities as appropriate in order to achieve performance objectives. Manage special assignments or short-term projects as needed. Gather various materials and date for special reports and special projects as assigned. Maintain established systems and training programs to provide a safe working environment. Maintain all records and reports necessary to comply with university, government, and accrediting agency standards, regulations, and codes. Develop and administer department budget. Approve/disapprove department expenditures. Develop short and long-term budget projections and plans. Provide financial status reports as needed. Maintain awareness and knowledge of current changes within legal, regulatory, and technology environments which may affect operations. Ensure senior management and staff are informed of any changes and updates in a timely manner. Establish and maintain appropriate network of professional contacts. Maintain membership in appropriate professional organizations and publications. Attend meetings, seminars, and conferences and maintain continuity of any required or desirable certifications, if applicable. Develop and implement security related procedures such as office opening and closing routines, recognition of duress signals and key controls. Coordinate security activities with Department of Public Safety. Promote and maintain standards for security conscious awareness and behavior. Maintain knowledge of University’s crime prevention and suppression programs and services. Ensure dissemination of security related information to staff. Education: Bachelor’s degree. Combined experience/education as substitute for minimum education. Excellent interpersonal skills and ability to build rapport with employees of all levels. Demonstrated analytical, relationship-building, and problem-solving skills. Experience managing, coaching, and training employees. Understanding and working knowledge of large venue, facility, or public assembly building operations and maintenance. Experience in event management including athletic competitions, musical concerts, community events, and/or filmings. Experience in the setup, execution, and teardown of events. Demonstrated ability to learn city and state building codes and OSHA work standards. Bachelor’s Degree in Sport Managements or related field. Benefits: dental and vision plans, tuition assistance for our employees and their families, paid time off, flexible spending accounts, 2:1 retirement plan contributions, child care centers and up to $50,000 housing subsidy. And because we are a qualifying public service organization, you may qualify for Public Service Loan Forgiveness (PSLF) for educational loans. Don’t believe us? Visit benefits.usc.edu. Perks: discounts to USC sporting events, USC Bookstores, wireless plans, travel, accommodations, and local entertainment. Career Growth: We are the largest private employer in Los Angeles offering tremendous development opportunities in multiple fields and industries. The Trojan Network connects current and previous members of the Trojan family to create an endless professional network. This support advocates work-life balance and employee well-being. As members of the Trojan family, employees are connected by the traditions and history that make us proud to be Trojans! As an equal opportunity employer, USC values and promotes diversity and inclusion in the workplace. The work culture thrives on mutual respect, trust, and synergy amongst all of its members. USC has great minds that transform the world with their talents and research. Will you be one? Join us! Understanding and working knowledge of large venue, facility, or public assembly building operations and maintenance. Experience in event management including athletic competitions, musical concerts, community events, and/or filmings. Experience in the setup, execution, and teardown of events. Demonstrated ability to learn city and state building codes and OSHA work standards.